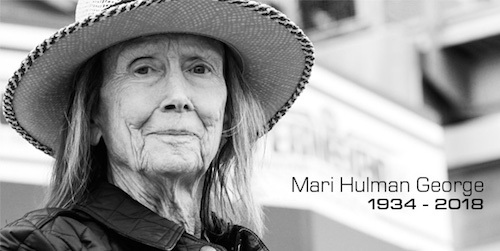 Mari Hulman George, Indianapolis Motor Speedway Chairman of the Board Emeritus, died Nov. 3, 2018, at the age of 83. George was IMS Chairman of the Board from 1988 to 2016. The Evansville, Ind., native was the only child of Anton “Tony” Hulman Jr. and Mary Fendrich Hulan. Her father bought Indianapolis Motor Speedway in 1945 when she was 10 years old. George’s philanthropic efforts were aimed at causes relating to children and animals. She was a trailblazer for women in racing, owning a race team prior to ascending to her position of IMS Chairman. Indianapolis Motor Speedway thrived under George’s watch, as the IndyCar rose in popularity; NASCAR, Formula One and MotoGP came to IMS; and the track led the development of the SAFER barrier system. George was preceded in death by her husband Elmer George and step-son Joseph George. She is survived by son Tony George; three daughters, Nancy George, Josie George and Kathi George-Conforti; step-daughter Carolyn Coffey; seven grandchildren; nine great-grandchildren and longtime companion Guy Trollinger. “Rest in peace, Mari. You’ll be missed,” retired four-time NASCAR champion and five-time Brickyard 400 winner Jeff Gordon (@JeffGordonWeb) tweeted.